The aim of this study was to examine the oral health-related behaviors in mothers and their children and the prevalence of dental caries in both. A sample of 2536 children and their mothers was selected from the Fifth Korean National Health and Nutrition Examination Survey. 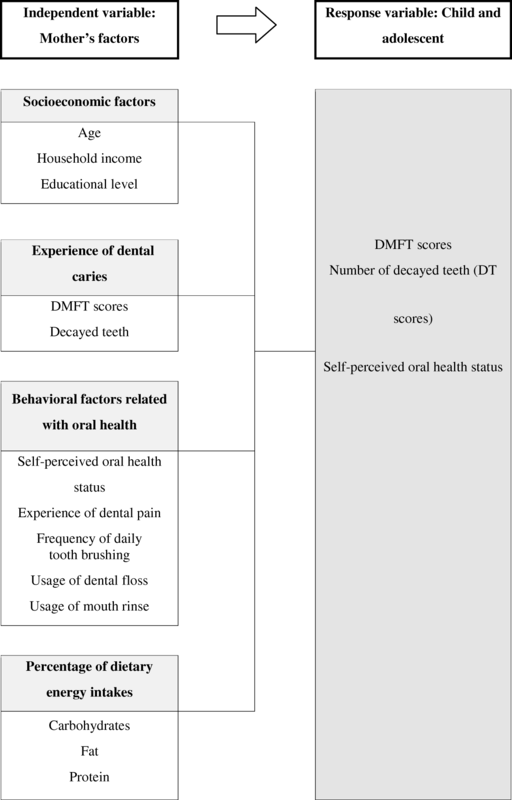 Variables were analyzed using multiple regression to evaluate the prevalence of dental caries among children and mothers, demographic socioeconomic status, and oral health-related behaviors. The average age of the mothers was 40.28 years and that of the children was 10.88 years. Mean DT scores were 0.67 for mothers and 0.29 for children. Mean DMFT scores were 6.63 for mothers and 1.76 for children. The higher the mother’s number of decayed, missing, or filled permanent teeth (DMFT score, B = 0.076, P < 0.001) and number of decayed teeth (DT score, B = 0.032, P = 0.038) in their permanent dentition, the higher the children’s DMFT score was for their permanent dentition. Children from mothers with low household income levels (B = 0.159, P = 0.043), with dental pain (B = 0.132, P = 0.032), and not using a dental mouth rinse (B = 0.135, P = 0.007) presented with higher DT scores. Children from mothers with low self-perceived oral health status (B = 0.113, P < 0.001), lower usage of dental floss (B = 0.100, P = 0.012), a lower ratio of protein intake to total energy (B = −0.017, P = 0.014), and lower ratio of fat intake (B = −0.009, P = 0.047) showed lower self-perceived oral health status. The better the oral health status of the mother, the better the oral health status of the child was. An effective oral health and education program for mothers should be developed to promote an improved oral health status of their children. Sun-Mi Lee and Han-Na Kim contributed as co-first authors equally to this work. Research supports the systematic review of factors affecting child dental caries, including the influence of social factors such as the family environment (Lorber et al. 2017). From the population health literature, Fisher-Owens et al. (Fisher-Owens et al. 2007) identified five key determinants of health: genetic and biological factors, the social environment, physical environment, health behaviors, and dental and medical care. Dental caries is an oral disease that occurs from infancy onward and frequently in preschoolers, elementary school children, and adolescents (Ryu et al. 2004). If a caries does not heal, it generally leaves aftereffects that can alter the development of the permanent teeth and the development of additional caries (Jin et al. 1992). Prevention is important to avoid suffering from dental caries, and oral health care should be continued from childhood (Hale 2003). Oral health care in infancy depends on adults, with parents generally playing the primary role in the health of children and adolescents (Kang et al. 2009). According to the Korean National Health and Nutrition Survey, there is still a high level of dental caries in Korean children. The Significant Caries Index (SiC index) among 8-year-old children was 2.73 in 2000 and 1.97 in 2012, and among 12-year-old children; the SiC was 6.13 in 2000 and 4.51 in 2012 (Kim et al. 2016). Becker et al. (1972) reported that attitudes, motivation, and beliefs about maternal care affect children’s oral care behavior. Maternal socioeconomic characteristics and beliefs about oral health influence the oral health behavior of children and adolescents (Chen 1986). Moreover, there is a difference in oral health knowledge and behavior among children and adolescents according to their socioeconomic characteristics (Okada et al. 2002; Rajab and Hamdan 2002), parents’ ethnicity, education level, and area of residence (Williams et al. 2002). Children’s oral health care habits are highly influenced by dental attendance and level of education of the mother (Wierzbicka et al. 2002). A previous study reported that Korean mothers’ oral health care behaviors were related to children’s mean number of decayed or filled primary teeth (Jang and Kim 2010), and a similar relationship between mothers’ oral health behaviors and child’s dental caries has been found (Kim et al. 2012). 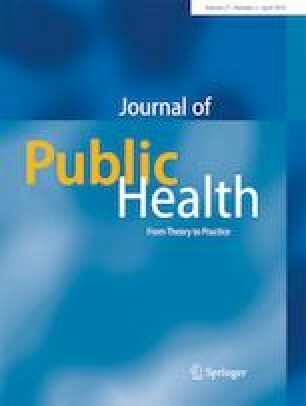 It is necessary to consider the family environment because the mother’s oral health appears to be an independent variable of explanatory power in a study of oral health promotion for 15 year olds whose self-consciousness formation is almost complete (do Carmo Matias Freire M, Sheiham A, Hardy R 2001). Previous studies have focused on parental socioeconomic factors and oral health knowledge and the impact of these factors on the oral health management of children and adolescents (Okada et al. 2002; Paula et al. 2012). However, research on mothers’ dental caries related to permanent dental caries in children and adolescents is not enough. In other words, there are few studies that have identified the relationship between mothers’ oral health indicators of objective oral health status and their children’s oral health indicators. Because of associations among mothers’ oral health, dental caries, and their children’s oral health, adult caregivers with poor oral health should be active in their treatments as well as education concerning their child’s oral health. Proper and sustained oral care of the permanent dentition determines the health of the oral cavity in adults. This differs from infants in which the dependency on their parents is high, and it is necessary to provide educational support because the health condition of the oral cavity is the first stage of responsibility. Therefore, we used the National Health and Nutrition Examination Survey of Korea to examine the relationship between oral health-related factors related to elementary school students and adolescents and their mothers’ caries and oral health factors to provide basic data for establishing a dental caries prevention policy. Data from the Fifth National Health and Nutrition Examination Survey of the Division of Disease Control conducted in 2010, 2011 and 2012 were used in this study. The goal of the survey was to gather national data about the health status, health awareness and behavior, and nutritional intake of South Korean citizens. Ethical approval was obtained from the Institutional Review Board (IRB no. 2010-02CON-21C, 2011-02CON-06-C, 2012-01EXP-01-2C). Oral examinations were conducted by two oral examiners of the Korea Centers for Disease Control and Prevention and 30 specialists in dental public health supported by the city and province. For the validity and reliability of the national oral health statistics, the the investigators’ training was conducted before the survey, the field supervision was conducted during the survey, and the questionnaires and the data were refined after the survey. The investigator training consists of lectures on the rationale and criteria for tooth conditions related to oral examination items; through actual photo training, the examiners learned the criteria for the examination based on basic methods for oral health surveys recommended by the World Health Organization. After that, the examiners were taught about making accurate judgments and providing guidance related to tooth conditions through model education. Inter-and intra-examiner reliability was measured using a model that reproduces various oral conditions and a recording sheet for actual use, and the errors confirmed in the process were corrected. Finally, four simulations of actual situations were performed four times for 20 volunteers to check the level of reliability improvement. The kappa index of the final stage agreement was 0.85 or more (Ministry of Health and Welfare 2016). We selected 3440 children between 6 and 15 years of age who completed the oral examination, health questionnaire, and nutrition survey. Children with the same household identification were matched with their mothers. From this total, 627 children had mothers who did not participate in the study, and 277 had insufficient responses, so that 2536 mother-child dyads were selected as the final research subjects. Number of decayed, missing, or filled permanent teeth (DMFT score) and the number of decayed teeth (DT score) were used. Included self-perceived oral health status, experience of dental pain for the past 1 year, frequency of daily tooth brushing, and usage of dental floss and mouth rinse. Self-perceived oral health status was classified as ‘very poor = 5,’ ‘poor = 4,’ ‘fair = 3,’ ‘good = 2,’ and ‘very good = 1;’ dental pain experience was dichotomized as present and absent. The frequency of daily tooth brushing was divided into ‘less than once a day,’ ‘twice a day,’ and ‘more than three times a day.’ The use of oral hygiene products was divided into ‘yes’ and ‘no’ concerning whether floss or mouth rinse was used. Figure 1. According to the nutrient Intake Standard of the Korean Nutrition Society (The Korean Nutrition Society 2016), we used carbohydrates, fats, and protein intake ratios, all of which are energy sources, as macronutrients. The self-perceived oral health status, DMFT score, and DT scores of children were selected as dependent variables (Table 1). Weighted samples were applied, and a complex sampling design was used. To generate a plan file calculating the integrated weights of 3 years, we used the stratification variable (variable name: kstrata) for variance estimates, the cluster variable, sample primary sampling units (variable name: PSU), as the cluster variable, and association of the survey, questionnaire, and nutrition weight as the weight variable. The association between child dental caries and mother-related factors including experience of dental caries, behavioral factors related to oral health, and percentage of energy intake was analyzed using correlation analysis. To confirm the relationship between mother and child variables, a multiple regression model was used, with the results expressed as the estimated regression coefficient (B), standard error (SE), and P value. The data were analyzed using IBM SPSS Statistics 23.0® (IBM Corp., Chicago, IL, USA), and the significance level was judged to be class I error 0.05. The gender distribution of the subjects was 54.7% males and 45.3% females (Table 2). The age of the mothers ranged from 35 to 44 years (74.6%). For income levels, 37.0% were in the third tertile and 35.2% in the second tertile. The level of education with the highest number of subjects was in the “college graduates” group (55.5%) (Table 3). The average age of the mothers was 40.28 years and that of the children was 10.88 years. Mean DT scores were 0.67 for mothers and 0.29 for children. Mean DMFT scores were 6.63 for mothers and 1.76 for children. The average perception of subjective oral health was 3.35 points for mothers and 2.99 points for children. The average number of daily tooth brushings was 2.61 times for mothers and 2.19 times for children. Carbohydrate intake per day was 66.58% for mothers and 64.07% for children. The daily protein intake rate was 14.56% for mothers and 14.01% for children. The daily fat intake rate was 19.19% for mothers and 22.14% for children (Table 4). Table 5 presents the correlation between mothers and children concerning caries experienced, oral health behavior, and energy intake. The DT scores of children were positively correlated with the maternal DT and DMFT score. Children’s DT scores were higher when the mother’s perceived oral health was poor or the number of brushings per day was low. DMFT scores of children were positively correlated with the maternal DT score and dental DMFT score. Children’s DMFT scores were higher when the mother’s subjective perception of oral health was low. The lower the percentage of protein and fat intake of the mother, the higher the self-perceived oral health status of the children. The number of daily brushings of the children was negatively correlated with the mother’s DT score and positively correlated with the number of the mother’s brushings (Table 5). Table 6 presents the association between the independent variables of mothers and the impact of these variables on the caries experienced by children in the regression model. Children raised by mothers who were in the high school graduate or lower group (B = 0.946, P = 0.013) had higher DMFT scores (B = 0.076, P < 0.001), and those from mothers who did not use a dental mouth rinse (B = 0.417) had higher DMFT scores (P = 0.007). Children raised by mothers in the 1st tertile income level (B = 0.159, P = 0.043) had higher DT scores (B = 0124, P = 0.002) and those whose mothers had dental pain (B = 0.132, P = 0.032) and did not use a dental mouth rinse (B = 0.135, P = 0.007) presented with higher DT scores. Children raised by mothers in the 2nd tertile income level (B = 0.103, P = 0.008) had higher DT scores (B = 0.032, P = 0.038), low self-perceived oral health status (B = 0.113, P < 0.001), lower usage of dental floss (B = 0.100, P = 0.012), a lower ratio of protein intake to total energy (B = −0.017, P = 0.014), a lower ratio of fat intake (B = −0.009, P = 0.047), and low self-perceived oral health status (Table 6). According to the 2015 Korean National Oral Health Survey (Ministry of Health and Welfare 2015), the DMFT of Korean children aged 12 years was 2.33, which is higher than in Germany (1.4), England (1.3), and Denmark (1.1) [(Country Oral Health Profiles 2016)]. Using the National Health and Nutrition Survey data, we examined the relationship among children, adolescents, and mothers’ dental caries and collected basic data for the prevention of their dental caries. As a result of examining the correlations between mother and child variables, the mother’s DT and DMFT scores were positively correlated with the DMFT score of the child. When the mother’s self-perceived oral health status was poor, the DMFT of the child was high. Mattila et al. (2000) reported that parental oral health concerns were associated with dental caries in children and adolescents. Kim et al. (2012) reported that the number of decayed, filled, and missing primary teeth in children is higher when the mother’s number of missing teeth is 3-4, and children’s DMFTs are higher when the number of maternal missing teeth is 5 or more. The dental caries experienced by mothers and children may be relevant, as we found that oral health care and ongoing guidance of children and adolescents is especially needed for mothers who have had many dental caries. Children’s DT scores were high when the mother’s self-perceived oral health status was poor or her daily brushing frequency was low. If the mother’s DT score, DMFT score, or self-perceived oral health status was poor, the self-perceived oral health status of the children and adolescents was also poor. The more frequent the mother’s daily tooth brushing was, the more frequently the child brushed. These findings are consistent with studies that have reported the greatest determinants of oral health status, knowledge, attitudes, and behaviors among children are related to their parents (Petersen 1992). Likewise, parental attitudes were found to be important factors in their child’s dental caries (Peretz and Zadik 1999), and self-perceived oral health status was associated with objective oral health status (Kim et al. 2005). These facts can explain the findings in this study, showing that the mother’s self-perceived oral health status is an important factor related to the oral health of the child. The number of children’s daily brushings was negatively correlated with the mother’s DT score, and the daily brushing frequencies of the child and mother were positively correlated. These results support the importance of the mother’s behavior and attitude in the home. After linear regression analysis, children from mothers with a low educational level and higher DMFT score presented with higher DMFT scores. On the other hand, the income level was not significant, whereas the use of mouth rinse was related to the child’s DMFT score. The adjunctive use of antimicrobial mouth rinses can provide significant benefits to patients who cannot maintain adequate levels of plaque and gingivitis control through mechanical methods alone (Barnett 2003). Within the National Health and Nutrition Examination conducted by the Disease Control Headquarters in 2015, the use of mouth rinses was 16.6% (Lee 2017), and the usage is gradually increasing (Macfarlane et al. 2010). As such, the impact of mothers’ mouth rinse use on children’s oral health should be considered. Children from mothers from a low income level with higher DT scores presented with higher DT scores. Children from mothers with dental pain and not using a dental mouth rinse showed higher DT scores, whereas the mother’s educational level was not identified as a significant factor. DT scores indicate the number of teeth that have been left untreated. Locker et al. (1997) demonstrated that patients with higher income levels used dental services and had lower DT scores and fewer missing teeth. Whitehead (1991) reported that income level affected not only the use of medical services, but also the overall lifestyle, such as diet and health management style, resulting in differences in oral health status. A mother’s toothache may be associated with maternal DT, which is the number of untreated teeth. Dental pain and using a mouth rinse were not significantly correlated with the DMFT scores of mother and child, but these two variables were related to the DT scores. Brondani et al. (2018) reported that dental treatment resulted in a significant improvement in the Oral Health-related Quality of Life (OHRQoL) of the evaluated adolescents. Children’s dental care can improve their OHRQoL, and, as such, children’s teeth should not be left untreated. Sayegh et al. (2002) showed that a lower prevalence of caries was reported in children of families where the father had a non-manual occupation and in those whose mothers had higher levels of educational attainment. Analyzing the 2006 National Oral Health Survey Data, Jung et al. (2009) reported that the higher the education level of the mother, the lower the dental caries experienced by the child. Additionally, children from high-income families were reported to have a low DT score (Baek et al. 2009; Kim 2004). In this study, DMFT scores were higher when income levels were lower and when the mother’s education level was lower. To reduce the incidence of dental caries in children and reduce inequalities in oral health, attention should be paid to households with low socioeconomic status and oral health education, and oral policies should be implemented. Self-perceived oral health status is one of the representative health measurement indicators used in many domestic and international studies (Hu et al. 2016; Manderbacka 1998). It is relatively easy to use as an indicator of oral health measurement (Chen and Hunter 1996; Slade 2002) and is used effectively to identify oral health inequality. Kim et al. (2012) reported that the high caries risk group had poorer self-perceived oral health than the low-risk group. The results of the present study showed that maternal-related variables affecting the self-perceived oral health status of children are age, family income, maternal DT score, maternal self-perceived oral health status, use of dental floss, and the ratio of protein and fat intake. Notably, the lower the percentage of the mother’s protein or fat intake, the worse the child’s self-perceived oral health status. This assumes that the lower the protein intake, the more sugary snacks are consumed. Balanced dietary habits play an important role in increasing resistance to dental caries. On the other hand, excessive intake of refined carbohydrates increases caries activity, so it was considered necessary to recommend cariostatic foods such as milk, cheese, and unrefined plant foods. The present study has several strengths. Few studies have evaluated direct oral health outcomes in adolescents and children using the DMFT or DT scores. We used these scores to examine whether the mother’s oral condition and oral health-related behaviors directly affected their children’s oral status. In addition, the population evaluated comprised a large sample size nested in a national cross-sectional study, a methodological design that allowed for the collection of data in a reliable way. Dental caries occur frequently in early childhood, elementary school childhood, and adolescence (Ryu et al. 2004). In addition, once caries occur, they do not completely heal and have an important influence on the oral health of children and adolescents. Therefore, dental care should be carried out starting in childhood, and it is important that mothers play a role in developing the ability of the child to manage their own oral health. Mothers are in a particularly important position to protect the health of the family and have the central role in maintaining and promoting oral health (Lee et al. 1996). The main findings of the present study are that mothers’ oral health and behaviors related to oral health are significantly correlated with children’s tooth caries. Therefore, it is necessary to consider the oral health of mothers and to develop effective oral healthcare and education programs for them to maintain a healthy oral environment for themselves and their children. The authors are thankful to all participants in the Fifth National Health and Nutrition Examination Survey.